你现在的位置：网站首页 - 谷歌优化 - 深圳谷歌优化公司客户案例：Shenzhen LightS Technology Co., Ltd.
深圳谷歌优化公司客户案例：Shenzhen LightS Technology Co., Ltd.
Shenzhen LightS Technology Co., Ltd is a private professional high-tech enterprise specialized in production, sales, research and development of multiple purpose indoor and outdoor LED display screens.LightS owns quite a solid fund support and high technical background in LED industry. The initial capital investment is RMB 10 million. Covering around 9,000 square meters, LightS has more than 300 employees,fully equipped large research and development centers and modernized production centers,comprehensive technical engineering test support and ten professional elites at home and abroad.Our products are widely used in various location and occasions such as advertising media, stage shows, entertainment, celebrations,exhibition, education, stadiums or arenas, plazas, malls, traffic, airports, stations and ports, etc. Our markets cover more than 80 countries and areas in Europe, America, Middle East, Africa and Southeast Asia. An enhanced sales and service network has been established.LightS acknowledges that innovation is an enterprise's vitality that leads to success. Having at present secured 50 patents in China, LightS spares no effort in innovation. Our products are certified by institutional tests such as CE, FCC and RoHS. From the very beginning of its incorporation, LightS has been advocating the management concepts of environment protection, energy-saving and low carbon, focusing on the development target of “innovating technology and benefit mankind”. 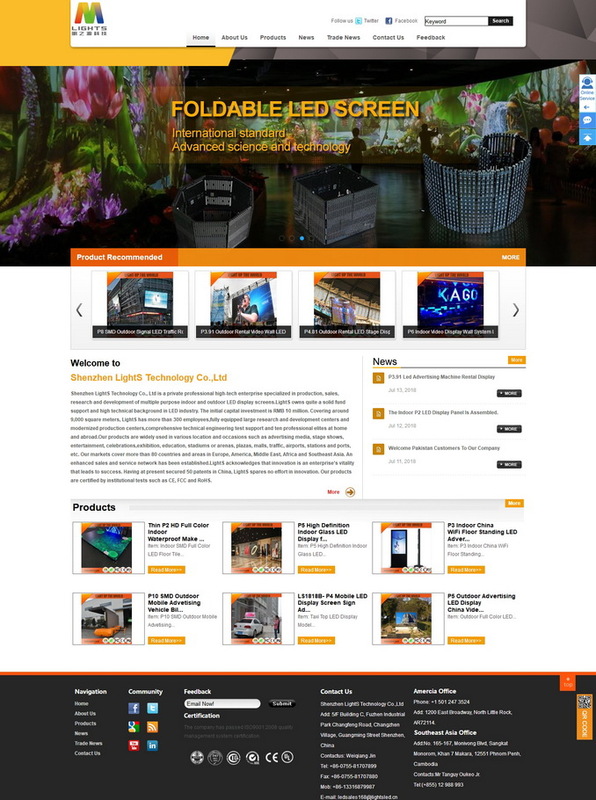 We proceed to build up our brand image as energy-saving photoelectric expert and LED Display expert. Let’s join our hands and realize our visions in this spectacular LED world.